When done properly, I sure do love a good singles series. While I've been a part of quite a few that fizzled out and disappeared into the night, All In Vinyl is still going strong with their singles club, which is entering its fourth year. Once again, the quality of bands they've brought on board this year is pretty stellar. 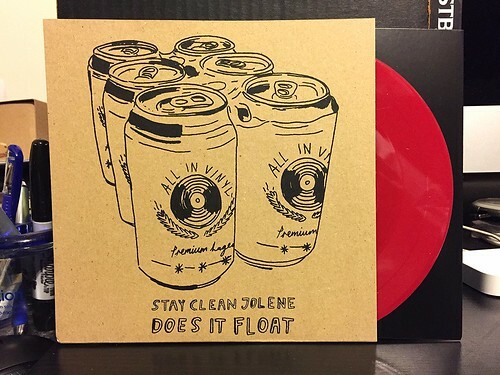 Volume 1 starts off with Stay Clean Jolene, one of my current favorite punk rock bands from the UK. Everything you would want from these guys are featured on their two songs. Raspy, impassioned vocals over loud and brash guitar riffs. They manage to straddle the divide between heart on your sleeve punk like Iron Chic (with those big, big sing along choruses) and the full throttle, driving style you've come to expect from bands like Leatherface. I've yet to hear a Stay Clean Jolene song I haven't liked, and these two are no exception. On the other side is Does It Float from Japan. These guys fully encapsulate what I love about a good singles series. I'd never heard of this band previously, but man these two songs just knocked my socks off. They could so easily fit in with the very best bands on Snuffy Smiles. In particular, they really remind me of the slightly slower, more thoughtful Japanese punk of bands like Three Minute Movie or Lovemen. Two absolutely spectacular songs. If anyone can point me towards any more of their records, please get in touch.